In today's post, S.K. Rizzolo offers a thought-provoking essay about racial attitudes in early 19th-century English society and the plight of those of mixed race. If you're a fan of the British period film Belle (2013), you'll find her post of particular interest. 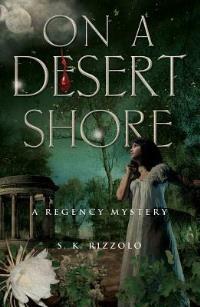 The 4th and newest volume of Rizzolo's Regency mystery series is On a Desert Shore (Poisoned Pen Press, March 2016). Readers of Georgette Heyer’s Regency novels are familiar with her references to skin care products such as Denmark Lotion or Olympian Dew. A young lady’s fair and blooming complexion could be just as critical to her success as her dowry and social position. Then, as now, those with unsightly spots sought to avoid embarrassment. But the ideal of complexion went much deeper than that. It was, in fact, tied to anxieties about Britain’s Empire, notions of proper Englishness, and the desire to maintain boundaries of class and race. In my novel On a Desert Shore, Marina Garrod receives every advantage of the privileged young lady. Rumored to be the heiress to vast wealth, she debuts in Society with the hope of making an eligible alliance. But to bigoted eyes, there’s a problem. All her father’s money cannot make her into a genuine “English Rose” (pink cheeks and red lips with pale skin)—for Marina is the daughter of a Jamaican planter and his slave-housekeeper. My novel is about Marina’s plight in the England of 1813, a time when attitudes toward race were hardening, in part because of growing fears of cultural and racial contamination. Her experience as a mixed-race heiress in Georgian England was not unique. In his dissertation entitled Children of Uncertain Fortune: Mixed Race Migration from the West Indies to Britain, 1750-1820, Dan Livesay estimates that, by the end of the 18th century, as many as a quarter of rich Jamaicans with children of color sent them home to England to live in a free society. On the whole these children were the lucky ones who had escaped the astoundingly brutal and oppressive sugar island. Still, families sometimes challenged the inheritances of their mixed-race kin, and the position of these young people would have been equivocal. It’s difficult to imagine how they might have felt. While Britain had halted its participation in the slave trade in 1807, slavery itself endured for several more decades in the colonies. Apologists for the institution, like Marina’s father, failed to justify a practice that was increasingly seen, according to the poet S.T. Coleridge, as “blotched all over with one leprosy of evil.” Here Coleridge refers to the arguments of West India merchants and slave owners, calling them “cosmetics” designed to conceal a horrible reality. Deirdre Coleman asserts that the British public of the day had a “fascination with complexion.” And my research revealed that this was especially true of white Creole women (Creole is an ambiguous term that sometimes meant the Blacks of Jamaica and sometimes a person of any race who had spent a lot of time there). I encountered stories of the white Creole women’s attempts to preserve their complexions so that when they returned to England they could seem like legitimate English roses. They wore elaborate sunshades and even flayed their skin with the caustic oil of the cashew nut! Often they created what even some contemporaries called an artificial and unhealthy pallor. Why? This was a society in which all-powerful white men exploited black women at their own whim and will, a society in which wives were often confronted with the humiliating results of open infidelity—their husbands’ slave children. It was important to the Creole ladies, whose skin could become tanned or weathered in the tropical climate, to maintain strict boundaries through their complexions. In other words, “whiteness” as a marker of status and breeding. But, ironically in this racially mixed society, it might not be possible to determine someone’s precise background just by looking. There might have been little visible difference between a Creole lady and her husband’s mulatta or quadroon concubine. When a woman named Janet Schaw traveled to North America and the West Indies between 1774-76, she wrote in her diary about putting on and off her delicacy “like any piece of dress.” To me, this points to the performative aspect of femininity. A woman can don a mask of beauty and gentility to further her ends or play her role in society. This is precisely what Marina cannot do to her tormenters’ satisfaction. And yet she is not afraid to express her fellow feeling with African slaves or her contempt for slavery. You will have to read the book to find out what happens after her failed London season. In essence, she is shipwrecked “on a desert shore” in an alien land, even though she is half English and has been mostly reared in England. She is no true English rose. 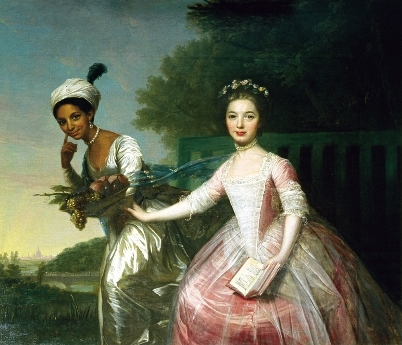 The famous portrait of Dido Elizabeth Belle and her cousin, Lady Elizabeth Murray. Belle was the daughter of an enslaved African woman and Sir John Lindsay, a British naval officer. After Lindsay brought his daughter to England, she lived with the Earl of Mansfield, the Lord Chief Justice, at Kenwood House in Hampstead. S.K. Rizzolo earned an MA in literature before becoming a high school English teacher and author. Her Regency mystery series features a trio of crime-solving friends: a Bow Street Runner, an unconventional lady, and a melancholic barrister. On a Desert Shore is the fourth title in the series following The Rose in the Wheel, Blood for Blood, and Die I Will Not. Rizzolo lives in Los Angeles. London, 1813: A wealthy West India merchant's daughter is in danger with a vast fortune at stake. Hired to protect the heiress, Bow Street Runner John Chase copes with a bitter inheritance dispute and vicious murder. Meanwhile, his sleuthing partner, abandoned wife Penelope Wolfe, must decide whether Society's censure is too great a bar to a relationship with barrister Edward Buckler. On a Desert Shore stretches from the brutal colony of Jamaica to the prosperity and apparent peace of suburban London. Here a father’s ambition to transplant a child of mixed blood and create an English dynasty will lead to terrible deeds. In the latter antebellum years the number of slaves whose phenotype was that of 'white,' and so many freed 'mulattos, quadroon, octoroons," created at some times and places an hysteria of anxiety about who was white, and how could anyone tell? Trials went on for months and months, with every aspect of the person -- and most of these seemed to be female -- intimately invaded by the regard and examination of judges, lawyers, juries and audience in the court room. Some of these suits were brought by those attempting to deny the defendants inheritances, because if proven to have that one drop of black blood, they were slave and unable to inherit. Quite like what you described in England. I'm one who is not a fan of Belle, as it is historically and legally incorrect, and the director - writer deliberately changed the facts to tell a story that she wanted to have had happen, but it did not,propagating then, a meretricious idea of the history of African Americans (or African West Indians? though the Caribbean is part of the Americas too! :)) and their legal status in England. But this is me, and others don't see it that way. Thank you for this thoughtful comment. I would like to read more about these trials in America. It's only too easy to imagine what evidence would have been considered appropriate! No doubt every detail of the woman's personal appearance and history was dragged before the court. As for Belle, I tend to agree with you. The film seemed romanticized to me. At least one is detailed in Walter Johnson's River of Dark Dreams (2013), within the section that describes the whites' black anxiety. What Blood Won't Tell: A HISTORY OF RACE ON TRIAL IN AMERICA by Ariela J. Gross is very useful. Fascinating--thank you so much for the reference. I'll check it out. Jane Austen's Sanditon featured a West Indian heiress of partial African descent, Miss Lamb, described as "tender and chilly." I often have wished for a modern Austen imitator to use her as the heroine of a novel. I read a continuation of Sanditon a few months ago (by Jane Austen and "Another Lady") and quite enjoyed it. I recall finding Miss Lamb enigmatic and intriguing. At least in this version the heroine Charlotte gets to know her a bit. I too would love to see more authors explore this character.